Just finishing up my first RSA story which will run tomorrow. There will be no others. Pwnie Express, the Vermont-based firm known for the Pwn Plug and Power Pwn, released a new appliance at RSA: the Pwn Pad. This handheld tablet allows security-and-IT-focused personnel to safely test their own network for wireless and wired security issues. The product brings an unprecedented level of ease to security testing, and has been met with critical acclaim at RSA. The Friday before RSA, Wired Magazine's Robert McMillan interviewed CEO Dave Porcello of Pwnie Express and tweeted "Just finishing up my first RSA story which will run tomorrow. There will be no others." Agreed. In spite of strait-jacketed pitchmen on unicyles, card tricks and robots, no other booth captured as much attention as the Vermont pentesting appliance company, Pwnie Express, in booth 2747. Their booth was as seemingly innocuous as their form factored pentesting appliances. The latest? 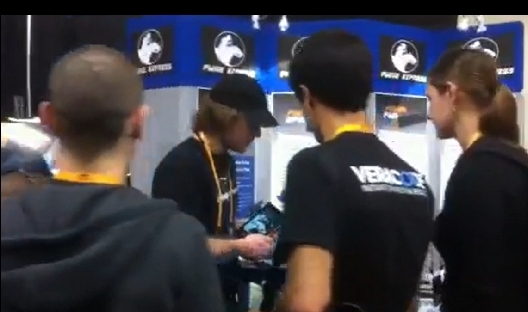 Pwnie Express introduced their Pwn Pad as crowds strained to see the newest innovations. This smart, commercial grade penetration testing tablet provides IT professionals an unprecedented ease-of-use in evaluating wired and wireless networks. The sleek form factor coupled with Android OS 4.2 and Ubuntu 12.4 make the Pwn Pad an ideal choice for professionals conducting a company or agency walk-through. Creating a tablet capable of doing Enterprise-level pentesting came with its own set of challenges. Chief Research and Developer for Pwnie Express, Oliver "Awk" Wies told Slashdot, "There were a lot of tools such as Kismet that had to be compiled from source. MBK3 and the latest version of Aircrack are on there, along with some of the cutting edge tools you just can't find in the Ubuntu repositories." Set to ship April 1st, the Pwn Pad is available for purchase at $795. The Pwnies will take their 'pwnie show' on the road again April 15-16th at this year's InfoSec in Orlando.